Al Gore’s been busy. This seems to be the thrust of An Inconvenient Sequel: Truth to Power, a follow-up to Gore’s landmark climate change doc An Inconvenient Truth (2006) that sparked a new way of talking about environmentalism and launched a thousand “green initiatives.” The looming heat death of our planet makes an appearance, of course, as do all the facts, figures, and evidence that come with such discussions. I’d like to say that this sort of stat fetishization is unnecessary at best and exclusionary at worst, and that the film engages in a fair bit of preaching to the choir. 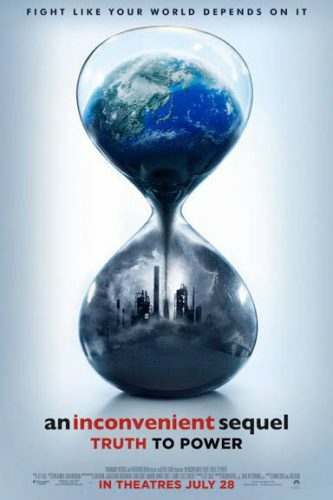 It is, and it does, but unfortunately there are still enough voices out there rejecting the very basis of the film’s subject that even a wan reification of climate science reality is needed every once in awhile. Hence the title. The other thing reified in this film, however, is the elitism, politicking, and palm-greasing endemic to the modern climate action movement as it stands. That’s where it comes back to Gore, moving and shaking through a litany of site visits and lectures and back rooms. This laser focus on the man-as-brand (look for the green circles of Gore’s Climate Reality Project sprinkled throughout) reveals a central failing of mainstream climate activism, and American politics moreover: personalities proclaiming mass action while the real agency rests with a few cabals butting heads over conflicting agendas. Not all is lost (a common motif throughout the film), but the film unwittingly presents a number of problems with Third Stage environmentalism in addition to its urgent and necessary message. The clearest example of the imbalance in the current state of climate activism is the rhetorical treatment of the poor throughout An Inconvenient Sequel. The film does not equivocate in recognizing impoverished communities as the frontline of environmental devastation. This is good. But at no point are the poor granted any direct engagement or platform. In fact, the most notable appearance of ordinary citizens (here defined as anyone not involved in Gore’s training program, and not a scientist, politician, or Silicon Valley innovator) comes in the form of what I can only think to describe as “climate bloopers”: a woman falls when her sandal sticks to the melting asphalt of a street in India, a motorist flips over the handlebars of their scooter while trying to ford a flooding intersection. These pratfalls signal an overall tonal dissonance in the film, with a sense of humor that amounts to something like dad joke black comedy. The culmination of this is an ill-advised quip about the failed evacuation of New Orleans post-Katrina that Gore makes during one of his lectures, which is easier to laugh at if you don’t think about the disproportionately elderly, black, and poor casualties lost at the hands of said failure. It’s clear that George W. looms large over Gore’s psyche still, with the Katrina crack serving as just one of many examples. There’s no beating around the Bush with regards to how the 2000 election results impacted our present climate situation, which is well and good. As much as my purity politics might color my frustrations with the neoliberal answer to environmentalism, I can’t deny that the Right’s attitude towards the planet is exponentially worse. It just might be more productive to hear about climate change from those that are most often victimized by it, instead of uncritically bolstering it as a feud between a few powerful stakeholders. That’s how we can avoid residual effects like lionizing Justin Trudeau, that handsome harbinger of our carbon apocalypse. He gets a stagey little cameo in passing, played in the moment for uplifting effect, which elicited perhaps the most enthusiastic round of applause and cooing from the audience. Trudeau’s bluster about Trump pulling the US out of the Paris Agreement is hypocritical at best, and it’s irresponsible to give him a spotlight, however brief, in a climate change doc. Contrast his treatment with that of the film’s other carbon enthusiasts and one of its primary antagonists, the Indian government, and we’re brought into some uncomfortably orientalist territory. For what it’s worth, I’ve seen Indian Energy Minister Piyush Goyal’s argument regarding equity in global energy consumption two times now. In an interview with David Letterman for a special on National Geographic last year, it was framed charitably and backed by hard evidence of India’s sustainable initiatives. In this film, it is treated briefly and as nothing more than obstinate, ignorant villainy. Gore spends a good portion of the rest of the film working against this obstacle, and India’s eventual buy-in on the Paris Agreement is presented as a triumphant climax. I’ll let others draw conclusions about what this moment of conquest envisages for the future of imperialism. Another sign of the ugliness just outside the frames of An Inconvenient Sequel is its overall artlessness, implying a certain insincerity or lack of conviction. Early on, there’s an attempt at a Herzogian helicopter shot of a glacier popping and breaking apart under the pressure of extreme, atypical Icelandic heat. An event that’s nearly awe-inspiring in its devastation and the nihilistic havoc it implies, or it would be if not for the unfocused, rattling brevity of it all. The same problem plagues footage of a rather thematically important rocket launch near the end of the film, which is such standard stock footage fare that I wonder why they even bothered. There’s sloppy blocking, and drifting gonzo camerawork that paradoxically feels artificial. One of the more baffling flourishes is a montage of ordinary folks shot in extreme vertical letterbox meant, I suppose, to evoke viral cell-phone camera footage. It is one of the film’s few unique aesthetic choices, and it falls incredibly flat. When the final call-to-action comes, in the form of text cards with helpful links and hashtags backed by music from something called OneRepublic, I couldn’t help but think I had just sat through an extended infomercial. This cynicism towards the film’s approach should not imply that I think Al Gore himself lacks conviction. I think he’s been a relentlessly positive force in a desperately important issue, and I admire his resolve. I join him in wondering what might have been. And I don’t mean to state that this is an entirely unnecessary film. It’s “told you so” mentality is warranted, and we need as many honest documents of environmental destruction as possible. Furthermore, the connection drawn between climate change and global terrorism (demonstrated at one point in entirely unexpected and harrowing fashion) is an underreported angle, and a point that needs to be hit as hard and as often as possible. But the economic realities of climate change, that its roots are largely in unfettered capitalism and that the world’s poorest are not equipped (see: unfettered capitalism) to take on the obstacles presented by these dramatic shifts, deserve fair and honest exposure as well. Maybe we can get ‘em next time, Al. Posted in Side Shots Film Blog and tagged Al Gore, Climate Change, Documentaries, Environmentalism, George W. Bush. Bookmark the permalink. Trackbacks are closed, but you can post a comment.